Did anyone else catch it? An absolutely unbelievable day's cricket, full of googlys, snorters, and tea-tray bowling. Simply marvelous stuff. 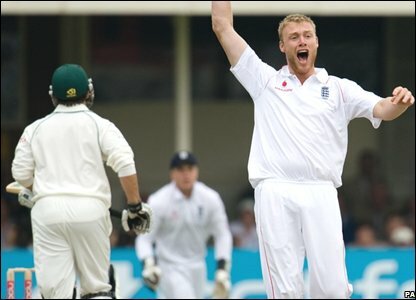 South Africa really had the lads under the screws, but Freddie Flintoff really brought us back into the game late with some of the best and most aggressive pace bowling I've seen in quite a while. What a menacing spell after tea! Simply cracking stuff... the Springboks were shitting themselves (proverbially of course: anything else would ruin the crisp brightness of their cricketing whites) as he rumbled in, over after over, with a will and a spirit that our pace attack hasn't seen in sometime. Consistently, Freddie was getting the ball in the blockhole and forcing the batsmen to nibble outside off-stump. As a fast-medium bowler, that's really the perfect area to aim at: a shade outside off-stump to the right-hander, and pitch it up so you catch 'em in two minds... do I sniff at it and cut it, or do I block it into the pitch. The South African nightwatchman Paul Harris did a smart job to kick off the morning, putting on 53 with McKenzie before lunch, although Sidebottom swung a nifty delivery in with his loose left-arm pace bowling and beat him for pace. He went after the ball and cuffed it to third slip where Cookie got his mitts 'round it. Lovely stuff. From then on after lunch, it was all South Africa until Freddie's afternoon spell. Gorgeous stuff in the dying embers of the sunlight. The umps held off with their light meters, and Freddie got in full swing, pocketing four wickets (four!) before the close to leave the first innings right in the balance. 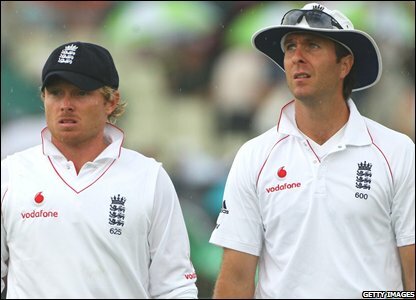 Anderson took a nice caught-and-bowled off Hashim Amla either side of Freddie's first brace of wickets, but it was that last hour-and-a-half when Flintoff really made the difference. He made short work of Kallis, McKenzie and the dangerous de Villiers before the day was done, and without that, we'd be buggered. Good show by the lads today. Let's hope they can polish off the tail in the morning session and get right back out to the crease to bat well into Day 3 and beyond. Come on lads, get it done over the next three days!